One of our friends, Addy, visited us at the end of March 2007. I took 3 days of and we arranged some free days for Yde at his school. We were doubting about our destination, Greece or some former Yugoslavian countries. We decided for the last because this would give both us and our friend a better insight in similarities and differences between Croatia and Bosnia Hercegovina compared to Serbia. 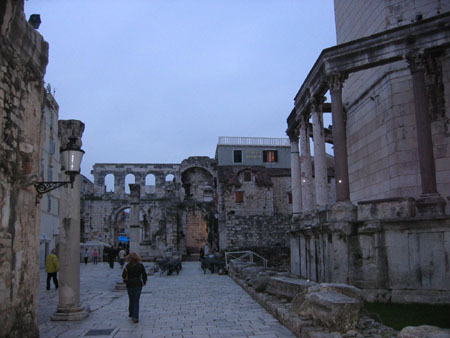 Split was our second destination after Zagreb. The highway between Zagreb and Split was finished recently just like the E70 on the Croatian side between Belgrade and Zagreb. It is around 392 kilomters to Split and the toll, if I remember correctly, will set you back about 17 euro's. Many modern tunnels with clear roadmarks for safety and great landscape views. Do not worry about gas stations, there are plenty good ones (including OMV) so it is easy to reach Split this way. 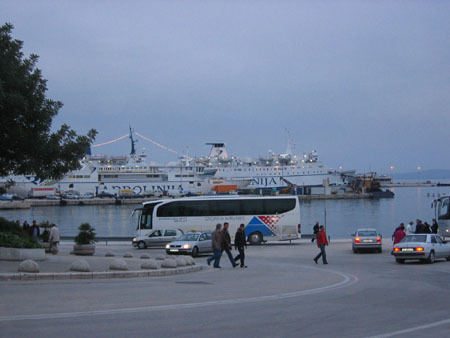 We arrived in Split around 16.30. This time it was more difficult to find the exact city center. Not because of the signs, they were there but it looked like we got lost in the one way circulation system around the old center. We wanted an hotel in the center but in the old castle they are small and cannot be reached by car. Just outside this castle they are overcharging. One of them asked 210 euro's for a basic room outside the touristic season, no thanks!. Therefore we settled for a simple hotel located a little bit outside the center but still within walking distance. Hotel Dujam is clean, not too expensive and with good beds, everything you need if you do not plan to spend half your day in a hotel. But do not expect more from this 2 star hotel, the lobby for example gave me the impression of a dentist waiting room. 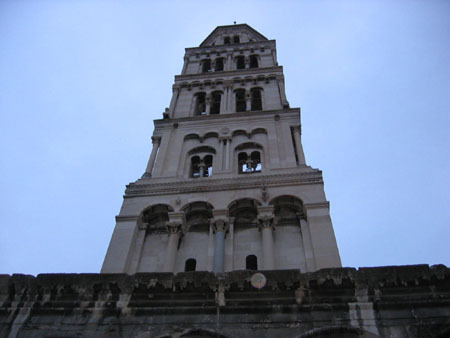 Split is a harbour city with a mediterranean climate. 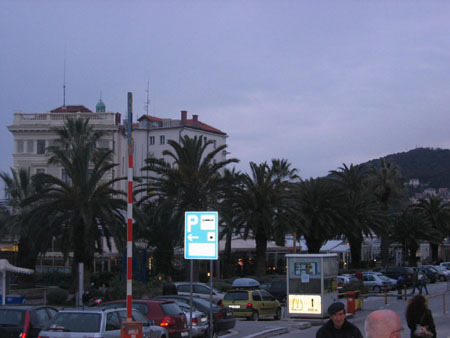 As soon as you reach Split you notice the big Palm trees and with a cruise boat in the harbour you easily get a holiday feeling. 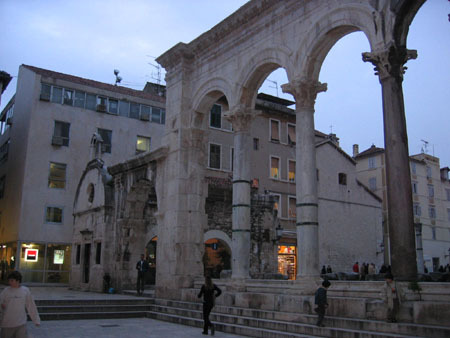 The old city is a pedestrian zone with inside some impressive remains of Roman architecture. The typical bell tower adds to the ancient atmosphere. 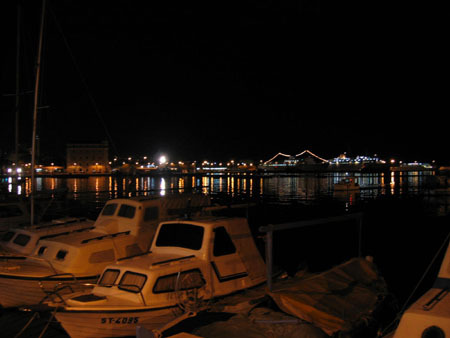 I read that Split is about the sunniest place in Europe but we were not that lucky because it was raining slightly. 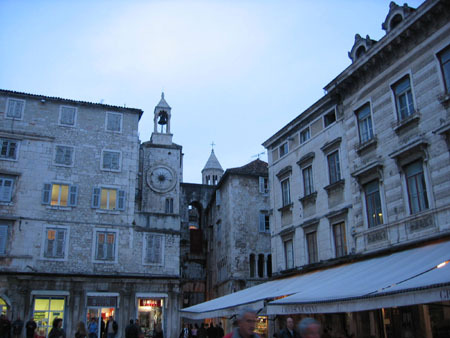 Anyhow, it is easy to imagine Split looking twice as nice on a bright sunny day. 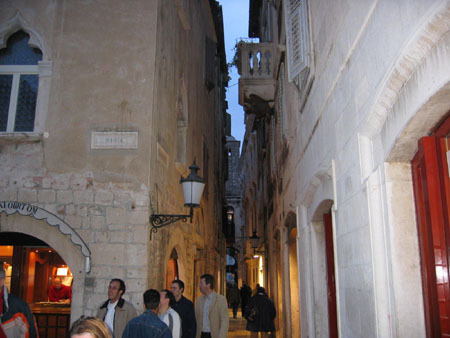 No special restaurant experiences like seafood testing in Split, the children wanted McDonalds. You have to ask or search a little bit because they are (luckily) not allowed to advertise with the bright yellow M. I did not find special 'Split' beer. Maybe they have some local stuff but we took one (or two?) Ozusjko beers in a small bar close to the hotel.